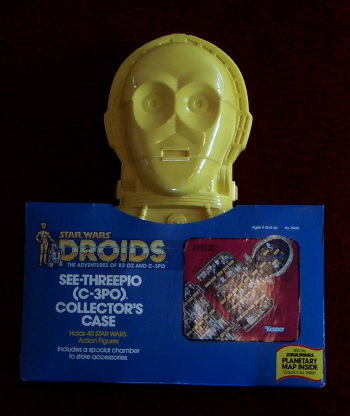 This is a boxed version of the unproduced Droids series C-3PO case. The packaging is a mock up used for catalog photography and possibly for use as a display at Toy Fair. The illustrations are pasted onto the cardboard. The front of the box illustrates portions of the packaging that were planned for the final product that never reached market. box.